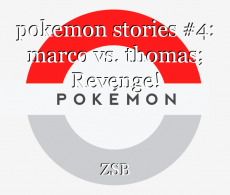 pokemon stories #4: marco vs. thomas; Revenge! The first battle between Marco and Thomas. this one was a bit shorter than the rest, simply because it's a two part battle. enjoy! Still in shock, I didn't know what to say. “ I choose you Arcanine, go!” Thomas yelled, thrusting the ultra ball into the air. It seems I have no choice but to battle, it's all or nothing. “ let's go Umbreon!” I called out, staring down Thomas. We just stood there for a few seconds, in a staredown. “ You have one chance right now to surrender all your pokemon to me. Well?” he said, continuing to stare me down with an evil smirk on his face. I put my right hand in my pocket and looked down at Umbreon, then back at Thomas, “ go, use sand-attack now!” I yelled. Umbreon ran into battle and shot up sand, smothering the arcanines face with sand. “now use aerial ace!” I said as umbreon shot inot the air . He was coming down with a head of steam when I heard thomas call out to arcanine “ arcanine, use extremespeed now!” and he struck umbreon straight on, taking him down in one fell swoop. He wasn't moving. I ran out onto the battlefield with tears in my eyes and picked up umbreon. “ Umbreon....here, take this.” I said as I tried to give him a full restoring potion. He wasn't responding to me. He was still breathing, but the site of umbreons' frail state sent me into a fit of rage. I blacked out. “ THOMAS!!! YOU'RE GOING TO PAAAAYYYY!! !” I screamed at the top of my lungs. Just then Valleri came through the brush. “ Marco, what's going on? Who is that.” she asked me, finally grasping what was going on. “Marco......” she asked nervously. “Take Umbreon out of here and bring him to Rustboro......NOW!” I ordered, taking the dark ball off my belt. She nodded her head hesitantly, but took umbreon and ran towards the southern end of the woods. Thomas was standing, waiting for me to throw out the pokemon. “ come on Marco, don't tell me you're out of worthy pokemon.” he said, taunting me with a smile on his face. “ Don't worry, you'll remember this next pokemon. Go Hypno, destroy his Arcanine!” I yelled, not realizing what I was doing. Thomas' eyes grew large and full of fear. “ No.....No, please not again. O-O-Ok Marco, I'll leave. You win, just put that monster away!” he pleaded, moving slowly away and calling back his arcanine. © Copyright 2019 SurfsUp. All rights reserved. I somehow knew this'll be happening. I wonder how this battle will end.